Mississippi storms can bring strong winds, heavy rain, and treacherous lightning—any one of which can send a tree toppling down on your home. Although there is really no way to prevent this from happening, the next best thing is to be prepared and know the immediate steps to follow when disaster strikes. Hopefully, you never have to experience a tree falling on your home, but if you do, remember Tri County Tree Service can help! We are Jackson, Mississippi’s top tree service provider. 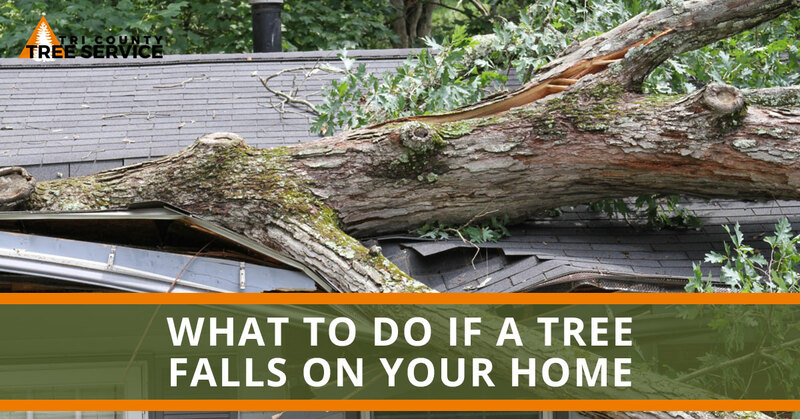 If a tree falls on your home or property, here is what you should do. If a tree falls on your home, exit the house as quickly and safely as possible. However, if there is a dangerous storm outside, move to a safe part of the home and wait for it to pass. When exiting, try to go out a door that’s not affected by the fallen tree, and be sure to avoid any down power lines or other hazards. Having an emergency evacuation plan prepared and practiced is always a great idea. It’s a simple practice that can have potentially life-saving benefits. This obviously depends on the severity of the situation. But if the fallen tree presents an immediate hazard—anything involving power lines or the chance of a reactionary accident—call 911 or local emergency authorities. They will advise you on what to do and send a fire crew or utility service to inspect the situation. If your cell phone is in the house, don’t risk going back in for it. Instead, use a neighbor’s phone, if possible. After the location has been inspected and cleared by emergency personnel, do your best to assess the damage and decide what needs to be secured to prevent further damage or problems. For example, if a tree falls on your roof, placing a large tarp over the exposed area can help mitigate possible damage. Similarly, if the tree created substantial damage that requires you and your family to be out of your home, make sure you do your best to safely secure your home, concealing any open areas that may signal an opportunity for an easy loot. If the tree damaged any of your property, you are going to need to call your insurance company. Ideally, you will want to talk to them before any big (costly) action is taken. You want to make sure they will agree to cover the removal of the tree and any necessary repairs that need to be made as a result of the fallen tree. They will also tell you about steps moving forward, and likely suggest that you take photos of the damage as soon as it’s safe to do so. Be sure to include up-close and far-away photos. Here is where it helps to have a reliable tree service company to come and remove the tree. And if it happens in the wee hours of the night, it’s especially nice to have a tree service provider, like Tri County Tree Service, who offers 24-hour emergency tree removal. When your tree service professionals remove the fallen tree, don’t forget to ask if they notice any other trees that could potentially become problematic in the future. After you’ve spoken to your insurance company and called your local tree removal service, you can begin making plans to repair any damage caused by the fallen tree. This may include your local roofing or siding company, or even home builder if you need significant repairs or are considered about the integrity of your home. Remember, the number one priority when dealing with a fallen tree is your and your family’s safety. If you are in the Jackson, Mississippi, area and your house or yard has become the destination for a fallen tree, call Tri County Tree Service.